There is well known to Us, Venerable Brethren – and it is a great cause of consolation for Our paternal heart – your constancy, that of your priests and of the great part of the Mexican faithful, in ardently professing the Catholic Faith and in opposing the impositions of those who, ignoring the divine excellence of the religion of Jesus Christ and knowing it only through the calumnies of its enemies, delude themselves that they are not able to accomplish reforms for the good of the people except by combating the religion of the great majority. Such things were on my mind as I watched “For Greater Glory,” a movie about the Cristeros, or “soldiers for Christ,” who fought against religious persecution by the Mexican government from 1926 to 1929. The movie starts with laws which encroach upon religious freedom relatively benignly, such as not allowing the public wear of religious symbols. The Mexican government then moves to decry foreigners who allegedly control the nation’s citizens, particularly the Vatican, and rounds up all foreign-born bishops and priests to force them to leave the country. Peaceful rallies and protests are responded to with military force, which leads to an economic boycott. One feature of the Civil War that sometimes is overlooked in histories of that conflict, is that the official reports of campaigns and battles usually were written months after the event. So it was with the Valley Campaign. Jackson did not have the leisure to write-up his official report until April of 1863, a month before his death from the fatal wound he received at Chancellorsville. It would have been a great loss to the history of the Civil War if Jackson had been killed before he wrote down his report on his remarkable campaign. In an earlier post, which may be read here, we looked at the first portion of the Valley Campaign. 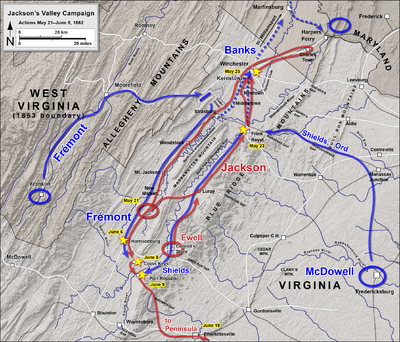 After chasing the Union force which he defeated at McDowell on May 8, 1862 almost to Franklin, Jackson began a return march to the Valley on May 15. Jackson’s goal was now to drive Bank’s army from the Valley. Swiftly concentrating his troops, he struck at a Union outpost at Front Royal on May 23. With 3,000 men, Jackson swiftly routed the Union force of a 1,000, capturing two-thirds of them. Jackson’s victory at Front Royal rendered the position of Bank’s position at Front Royal untenable, and he began to retreat. Jackson pursued with the customary swiftness that caused his infantry to be dubbed “foot cavalry” and defeated Banks at the battle of First Winchester, Jackson’s 16,000 man force inflicting 2000 casualties on Bank’s army of 6500, in exchange for 400 casualties. Inscription on the memorial to the dead of the British 2nd Infantry Division at Kohima. One of my earliest memories is being called a “Dirty Yank”. My Dad met my Mom while he was in the Air Force in Newfoundland. After his enlistment ended he was unable to find work in Saint John’s, my Mom’s home town, so the young couple traveled to my Dad’s home town in Paris, Illinois. I made my appearance shortly thereafter. My Mom, who was all of 21 at the time, grew homesick, so she and my Dad, an elderly 24, pulled up stakes again and moved back to Saint John’s. Family tranquility was forever destroyed when my little brother arrived a year and a half later, as he and I quickly put our heads together for campaigns of mischief and nefarious activities which enlivened my childhood. The family stayed in Saint John’s until I was four, jobs were still scarce on the ground there, alas, before the family moved back permanently to Paris in the summer of 1961. During our stay in Saint John’s I met all of my maternal relatives on a frequent basis, and other than my maternal Grandmother and Grandfather, my favorite was no doubt my great Uncle Bill Barry. Whenever he would come over he would yell out, “There’s that Dirty Yank!” I would lisp out in return, “There’s that Dirty Newf”! 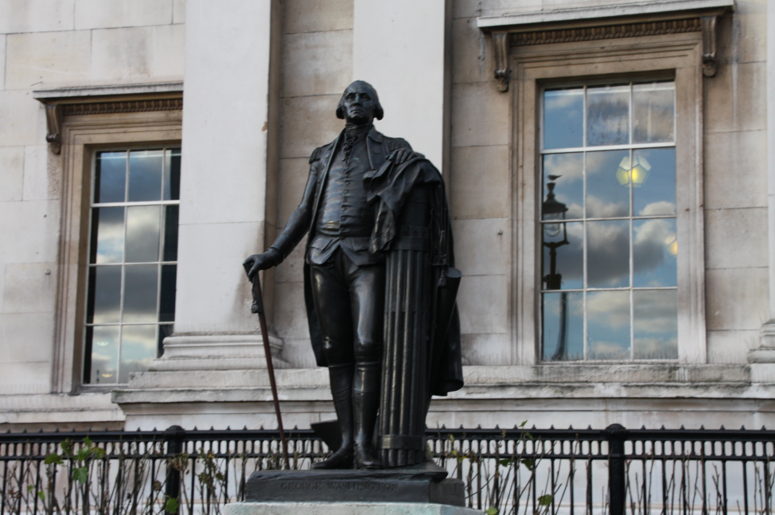 American travelers in London, at least those who pay no attention to tour guides, are sometimes astonished when they see the above statue of George Washington in Trafalgar Square. A gift from the people of Virginia, the statue bears the inscription: “Presented to the people of Great Britain and Ireland by the Commonwealth of Virginia 1924”. The presence of the statue in London is a tribute to the good relations that have existed between Great Britain and the United States for more than a century. 10. The Gallant Hours (1960)-James Cagney as Admiral William F. “Bull” Halsey, video clip at the beginning of this post, the film highlighting Halsey’s brilliant leadership in the fierce naval battles that raged around Guadalcanal in 1942. The importance of Guadalcanal was put succinctly by Halsey: “Before Guadalcanal the enemy advanced at his pleasure. After Guadalcanal, he retreated at ours”. 9. John Paul Jones (1959)- Robert Stack, just before he rose to fame in the Untouchables, is grand in the role of the archetypal American sea hero. Bette Davis is absolutely unforgettable as Catherine the Great. The climactic sea battle with the Serapis is well done, especially for those pre-CGI days. The only problem with the film is that many of the details are wrong. This is forgivable to a certain extent since scholarship on Jones was badly skewed by Augustus Buell in a two volume “scholarly biography” which appeared in 1900. Buell was a charlatan who made up many incidents about Jones and then invented sources to support his fabrications. Buell was not completely exposed until Samuel Eliot Morison, Harvard professor of history, and an Admiral in the Navy, wrote his definitive biography of Jones. Here is a list of the fabrications of Buell compiled by Morison. Morison’s book appeared after the movie, which is to be regretted. Appearing in the film were several Marine veterans of the Pacific, including Colonel David Shoup, who earned a Medal of Honor for his heroism at Tarawa, and who would later serve as a Commandant of the Corps, and Lieutenant Colonel Henry Crow who led a Marine battalion at Tarawa. The Marine Corp hymn is sung in the film after the death of Wayne’s character, one of ten films in which a Wayne character died, and as the raising of the flag is recreated. Taking part in the flag raising were Rene Gagnon, Ira Hayes and John Bradley, the three survivors of the six flag raisers who survived the battle. (The three men who raised the flag and subsequently died in the battle were Franklin Sousely, Harlon Block and Michael Strank.) (First Lieutenant Harold Schrier, who led the flag raising party that raised the first, smaller, flag on Mount Suribachi, and who was awarded a Navy Cross and a Silver Star for his heroism on Iwo Jima, also appeared in the film.) The flag on top of Mount Suribachi could be seen across the island, and was greeted with cheers by the Marines and blaring horns by the ships of the Navy. A mass was said on Mount Suribachi at the time of the flag raising and I have written about that here. Go here to see the ending of the Sands of Iwo Jima and listen to the Marines’ Hymn. 7. The Horse Soldiers (1959)-In 1959 John Ford and John Wayne, in the last of their “cavalry collaborations”, made The Horse Soldiers, a film based on Harold Sinclair’s novel of the same name published in 1956, which is a wonderful fictionalized account of Grierson’s Raid. Perhaps the most daring and successful Union cavaly raid of the war, Colonel Benjamin Grierson, a former music teacher and band leader from Jacksonville, Illinois, who, after being bitten by a horse at a young age, hated horses, led from April 17-May 2, 1863 1700 Illinois and Iowa troopers through 600 miles of Confederate territory from southern Tennessee to the Union held Baton Rouge in Louisiana. Grierson and his men ripped up railroads, burned Confederate supplies and tied down many times their number of Confederate troops and succeeded in giving Grant a valuable diversion as he began his movement against Vicksburg. The film is a fine remembrance of the courage of the soldiers North and South who fought in our war without an enemy. 6. Red Tails (2012)- This film was released on Blueray this week, and I have been viewing it and enjoying it immensely. Blacks have served in all of America’s wars, in spite of the racial hatred that was often directed against them during their service. In World War II the military was still segregated, and opposition to blacks serving as pilots was intense. However, the Army Air Corps could not ignore that blacks had passed the tests to qualify as aviation cadets. Trained at Tuskegee University in Tuskegee, Alabama, the 99th Pursuit squadron was activated in 1941 and sent overseas to North Africa in April 1943. The 99th served in the Sicilian Campaign and in Italy. In the Spring of 1944 it was joined by the 100th, 301st and 302nd pursuit squadrons and formed the all black 332nd fighter group. The 332nd flew as escorts for bombers flying bombing raids into Czechoslavakia, Austria, Hungary, Poland and Germany. The 332nd became known as the Red Tails, or Red Tail Angels, for the red paint on the tails of their planes, and for the skill with which they guarded the bombers they escorted. The men of the 332nd in their time in combat destroyed 261 enemy planes, damaged another 148, and flew a total of 15,533 combat sorties. They suffered 66 pilots killed. 95 Distinguished Flying Crosses for heroism were earned by the pilots, along with other awards for valor, and the 332nd received three President Unit Citations. A bomber group, the 477th Medium Bomber Group, consisting of the 616th, 617th, 618th and 619th bomber squadrons, was formed from Tuskegee Airmen, but the War ended before the unit was deployed overseas. Red Tails, is a long overdue salute to these men who had to fight not only the enemy but the racial prejudice of many of their fellow Americans. They were a credit to their nation and to their race, the human race. He was a Caesar without his ambition; a Frederick without his tyranny; a Napoleon without his selfishness; and a Washington without his reward. Great Americans fought on both sides of the Civil War, and one of the greatest of Americans, of his time or any time, was Robert E. Lee. Always outnumbered, with troops often dressed in rags, ill-fed, ill-supplied, he led his men to magnificent victories in the Seven Days, Second Manassas, Fredericksburg and Chancellorsville. Fighting another great general, Grant, he achieved a stalemate in 1864 against an army that had more than a two-to-one advantage, and prolonged the life of his country by almost a year. A fighting general with a propensity for taking huge risks, he was also a humane man with unfailing courtesy for both friend and foe. A true Christian, he did his best, in turbulent times, to live the teachings of Christ. In regard to the great issues of his day, he was opposed to secession as he indicated in this letter to his son “Rooney” on January 29, 1861: “Secession is nothing but revolution. The framers of our Constitution never exhausted so much labor, wisdom and forbearance in its formation, and surrounded it with so many guards and securities, if it was intended to be broken by every member of the Confederacy at will. It was intended for ‘perpetual union’ so expressed in the preamble, and for the establishment of a government, not a compact, which can only be dissolved by revolution, or the consent of all the people in convention assembled. It is idle to talk of secession.” When Virginia seceded however, he decided that he had no choice but to fight in her defense. He attended Saint Edmond’s and Saint Gabriel’s grade schools and then attended a preparatory seminary for high school. Brett entered the Marist novitiate at Our Lady of the Elms on Staten Island and made his profession of vows on September 8, 1956. Studying at Catholic University, he received a BA in philosophy in 1958 and a Master’s Degree in Latin in 1963. He was ordained a priest of the Society of Mary in 1962 by Bishop Thomas Wade at the Basilica of the National Shrine of the Immaculate Conception. Father Brett was commissioned a Lieutenant in the Navy, and, after training at the Chaplain School in Newport Rhode Island, and Marine combat training at Camp Pendleton, California, he arrived in Vietnam on September 15, 1967, assigned to the 2nd Battalion, 26th Marine Regiment, 3rd Marine Division. His goal was simple: wherever Marines in his unit were in danger he was going to be there, to say Mass, give the Last Rites to the dying and help the wounded. His own personal safety was simply going to have to take a back seat to this mission. His superiors quickly realize that this priest was going to need an assistant and a guard since he was so intent on going into harm’s way. They assigned him Corporal Alexander Chin, a truly remarkable Marine. Of African-American and Chinese ancestry, Corporal Chin had served in Vietnam for several months when he had a religious conversion. He announced that he could no longer kill the enemy, but that he had no problem still putting his life on the line for his country. Assistant and guard to a chaplain seemed like an appropriate assignment for this particular Marine. Much of Father Brett’s service in Vietnam centered around the Battle for Khe Sanh. Situated in northwestern Quang Tri Province, Khe Sanh was next to the border between North Vietnam and South Vietnam. The North Vietnamese sought to replicate their victory at Dien Bien Phu over the French in the 1950’s by massing several divisions and overrunning the Marines at Khe Sanh. They failed, and the Marines inflicted far more casualties on the North Vietnamese Army than they sustained. Intense fighting at Khe Sanh lasted from January 21, 1968 to April 8, 1968, and Chaplain Brett was in the thick of it, along with Corporal Chin.